Our scented jar candles are ideal to add a wonderful ambience to any room and can help you relax and unwind while you’re on the move. Made in England with 100% natural plant wax, add some candle-lit cosiness to your surroundings with our luxury scented candles. 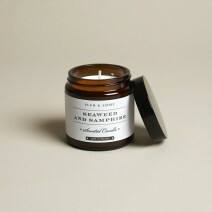 With a 20 hours burn time and the finest ingredients, our special jar candles come in a glass jar with a lid. A walk along the seafront watching the deep blue waves crash onto the golden sand and the fresh salty sea air blowing gently. Our favourite places to visit on a weekend is the seaside and this scented candle quickly evokes these feelings with a rich, dark aroma of the sea along with a woody, musky base note of samphire. This really works to boost energy levels and helps you feel relaxed. What makes our candles special? Hand-poured by skilled craftsmen in the South of England, 100% natural plant wax and cotton wicks; these things make our scented jar candles special. Infused with fragrant scents, our natural plant wax luxury candles are environmentally friendly, burn cleaner and longer and help to add an atmosphere to any room.